If your business needs powerful computer processors but you have a tight IT budget, never fear. Refurbished servers could be the answer. Whether you’re installing servers for the first time or updating your old equipment, refurbished equipment can meet your tech needs for a fraction of the cost of buying new. If you’re like many folks, you may be skittish about the idea of buying refurbished equipment. You’re probably concerned about whether refurbished servers will be reliable, whether they’ll last as long as you need them to and what kind of tech support you’ll get when you buy refurbished servers and equipment. Luckily, refurbished equipment is just as high-quality and reliable as new equipment — it’s cheaper because the costs of refurbishing an older piece of computer equipment are much lower than the costs of manufacturing a brand new one. A used piece of computer equipment would be one that passes from the possession of one owner, straight into the possession of another owner, without getting any repairs in between and maybe without being reset to factory settings. While many people conflate refurbished computer equipment with used equipment, the two things are not the same. Reputable computer equipment resellers obtain their servers and other equipment from organizations that sell their equipment in order to upgrade to newer systems. Often, the old equipment is still in perfect working order and has much use left in it. The reseller makes any necessary repairs to the equipment, cleans it out, gives it a new coat of paint to restore its like-new finish and then resets the equipment to its factory settings. Refurbished equipment can typically offer anywhere from three to five, or even more, years of usability. Many people wonder if refurbished hardware can be expected to be as reliable as new hardware. The fact of the matter is that refurbished servers and equipment are just as reliable as new equipment. Resellers test refurbished equipment thoroughly and repeatedly throughout the refurbishment process. Refurbished equipment is not made with inferior components. Refurbished equipment may be repaired with third-party components, but these third-party components are typically used to build the new equipment, as well. Secondary market providers save on the cost of refurbishing electronics by buying these components direct from the manufacturer. All reputable sellers of refurbished IT equipment provide warrants and tech support for their products. For example, xByte Technologies is a premier reseller of IT equipment, and they provide warranties and customer support comparable to those provided with new equipment. Refurbished equipment is also usually eligible for original equipment manufacturer (OEM) and third-party maintenance agreements. If you’ve held back from purchasing refurbished server and computer equipment because you’re concerned that you’d only have older generation equipment to choose from, you’ve been missing out. Refurbished older generation equipment is certainly available at a discounted price, but you can also find refurbished versions of the latest server and computer equipment, for a fraction of the cost of buying new. 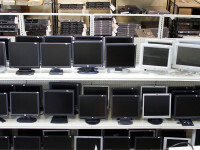 The market for refurbished IT equipment is vast. Most companies and institutions, especially ones that run their own data centers, rely on refurbished tech. It’s the only way most of them can afford to stay in business and stay on top of the update cycle. When you buy refurbished equipment, you can get your order filled right away in most cases — and if you can’t get the up-to-date equipment you need on the spot, you’ll be able to get it within a few days from most secondary market providers. Compare that to ordering brand new equipment from a manufacturer, where you might have to wait weeks or months to get your machines built and your order filled. Don’t believe the myths about refurbished equipment. When you buy refurbished servers and computer equipment, you’re getting equipment that’s been professionally repaired and rigorously tested to meet all industry performance standards. You’ll get the same level of performance, reliability, customer support and warranty protection that you’d get if you bought new. Of course, you’ll save a ton of money — and that’s the reason why more and more companies are turning to equipment resellers to meet their data needs.